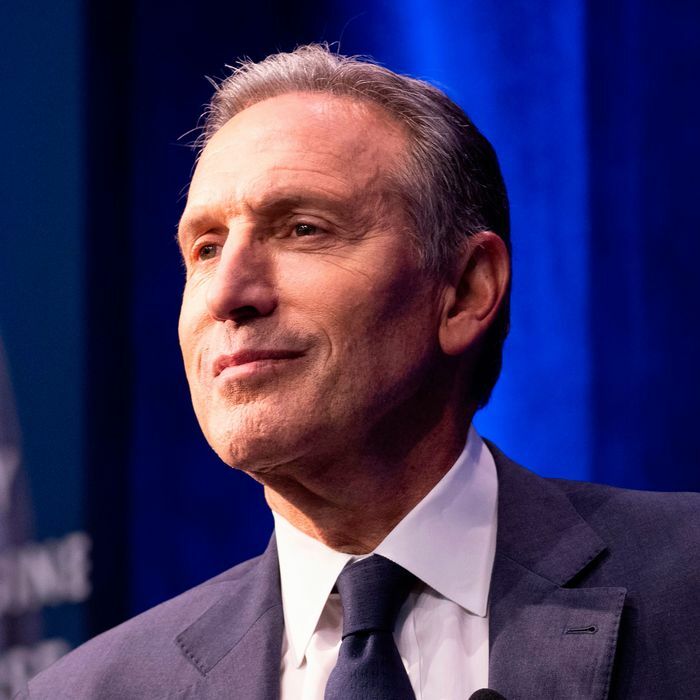 Howard Schultz is sick of the left’s impossible promises. The Starbucks billionaire believes that the American people deserve straight talk, and fiscal realism — and that the Democratic Party is incapable of giving them either. When Schultz hears Democrats say that the United States should emulate Canada’s single-payer health-care system (which produces better health outcomes at lower costs than our own), he thinks they’re peddling a “false narrative” on par with Trump’s tall tales about the border. “Doesn’t someone have to speak the truth about what we can afford while maintaining a deep level of compassion and empathy for the American people?” Schultz asked the New York Times this week. The billionaire has concluded that the answer to his query is yes, and that he just might be that someone. Therefore, he has begun loudly mulling an independent presidential bid in 2020. In recent days, Schultz has promised to reduce economic inequality, end extreme poverty, cut the deficit, combat structural racism, and ensure that every American has access to quality health care — while keeping taxes on the rich near historic lows. And yet, Schultz justified his decision to (potentially) run for the presidency as an independent on the grounds that the Democratic Party’s newest tax policy ideas — including Alexandria Ocasio-Cortez’s call for taxing incomes above $10 million at a 70 percent rate (a rate that applied to incomes above $216,000 as recently as 1980) — were unacceptably extreme. What’s more, in a recent interview with 60 Minutes, Schultz suggested that Donald Trump was right to lower the corporate tax rate, but should have done more to cut taxes for the middle class. During that same interview, Schultz expressed his support for universal “access” to health care, and lamented the fact that “over 40 percent of the American people don’t have $400 in the bank,” while “one out of six people in America are food insecure.” And yet, the billionaire also argues that Social Security and Medicare benefits need to be cut, and that the middle class deserves a tax break — a position that, when combined with his opposition to soaking the rich and support for deficit reduction, ostensibly rules out any major expansion of anti-poverty programs or health-care subsidies. In sum: Schultz is promising to reduce inequality by keeping taxes on corporate shareholders lower than they were under Obama, to reduce the deficit by slashing taxes on the middle class, and to end poverty by cutting two of the most effective anti-poverty programs in American history. The billionaire’s incoherent position on inequality is either an expression of towering ignorance or bad faith. If Schultz’s actual position is that “we can’t continue to add onto the inequality,” then he should be criticizing Elizabeth Warren’s wealth tax from the left. As for how Schultz squares his support for deficit reduction with his opposition to significantly raising taxes: The billionaire told CNBC last summer that the key to fixing the debt problem (besides gutting Social Security) was to grow the American economy by “4 percent or greater” each year. 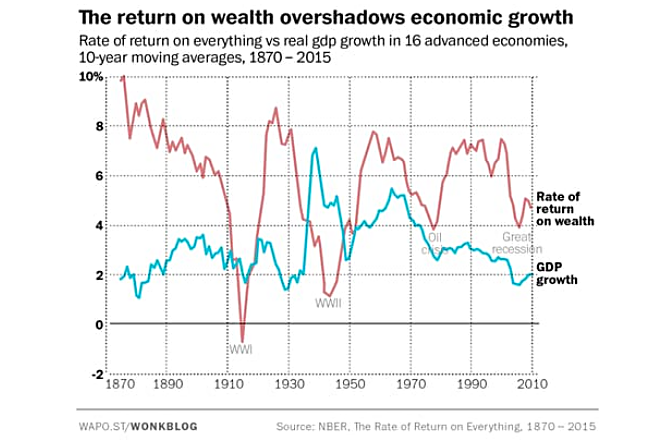 In other words: simply engineer an economic miracle (that is quite plausibly incompatible with long-term human survival) through unspecified means. In reality, Schultz’s problem with the Democratic Party isn’t that it refuses to tell Americans “the truth about what we can afford.” His problem is that Democrats are no longer telling bleeding-heart billionaires like himself the lies they wish to hear. Schultz wants a president who will assure him that there is no relationship between the wealth that he hoards and the poverty he can’t help but notice; or between his deficit fearmongering and his nation’s sky-high uninsured rate; or his opposition to a $15 minimum wage and widespread food insecurity; or his visceral disgust with the very concept of Carter-era top marginal tax rates and income inequality; or his ability to effortlessly finance a campaign for America’s highest office — despite boasting no governing experience or grassroots support — and the American public’s belief that their political system is broken. Unfortunately for Schultz, only about 0.1 percent of the electorate wants the same.